This project is being featured on the Canadian Scrapbooker blog this week, so to see the complete photo step-by-step tutorial and supply list, please click HERE. Thanksgiving is also a time for me to think about what I am grateful for in my life. I’d have to say my family is definitely number one, and I’m especially enjoying the changing relationships among my children. Meaning….there is less squabbling! Ha! I’m also thankful for the teaching opportunities I’ve had lately. Canadian Scrapbooker magazine has opened up some new possibilities for me, and I love teaching at events as part of their DT. Designing and writing for the magazine is the best thing that has happened to me in the past few years. The Kaisercraft photo display frame looks beautiful with the Take Note collection. There are a few fun techniques thrown in, with some cool copper metallic elements. Click HERE to register for my class. The pictures are my kids from last Fall…..and I’m still trying to round them up before the leaves blow away for this year’s photo shoot. Ack. It’s like herding cats! I might resort to threats soon. I wish you and your families a very blessed and Happy Thanksgiving! Your table certainly will look special with those cute place cards! I love the photo frame too! 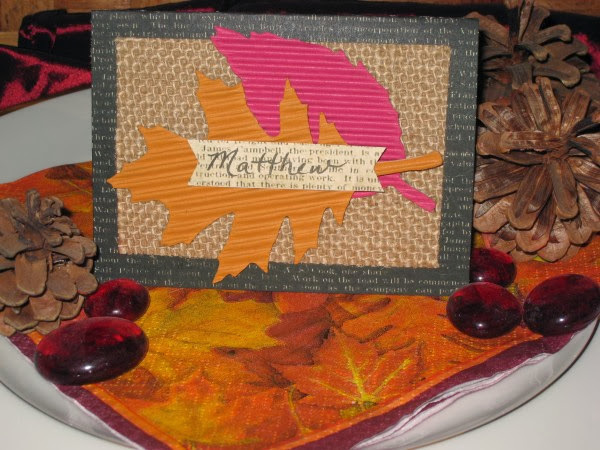 Fall colors are just so beautiful and combined with the gorgeous photos and embellishments, it makes for a wonderful project! What a pretty table you are making with those place cards. You always have the best ideas. Can’t wait to see the Fall photos and hear the story of behind-the-scenes!! And I am thankful for friends like you! Thanks for sharing your heartwarming blog with us, my friend! Love the picture frames. How lucky the class participants are to have you!